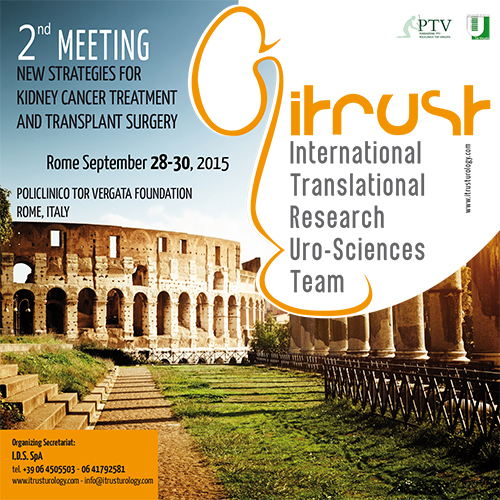 We are pleased to announce the 2nd ITRUST meeting in Rome next 28-30 of September 2015. ITRUST (International Translational Research in Uro-Sciences Team) is a small group of young urologists interested in translational and clinical research in different field of urology. 1. Diagnosis and management of small renal masses: what is the treatment of choice? active surveillance Vs minimally invasive surgery Vs ablative techniques. 2. What to do for an intrarenal lesion: the difficult management of a small mass in a young patient. 4. What’s new in the pharmaceutical for the metastatic renal cancer treatment? 5. Where do we stand with renal transplant: has something changed in the last years? 6. The role of the living donor nephrectomy: numbers and results in Europe and United States. 8. How to transplant. The emerging role of the DaVinci Robot. THE LIVE-SURGERY SESSION WILL SHOW DELEGATES A VARIETY OF SURGICAL PROCEDURES FOR THE TREATMENT OF SMALL RENAL MASSES AND LIVE DONOR NEPHRECTOMY INCLUDING, FOR THE FIRST TIME IN A LIVE SURGERY SESSION, A LAPAROSCOPIC LIVING DONOR NEPHRECTOMY FOLLOWED BY A ROBOTIC TRASPLANT. All the surgical procedure will be transmitted in 3D-HD video quality by a dedicated optic fibers transmission …… do not loose it!!!! The site has been update recently. Please check links on this page. Some pages are under construction.